Some of you might feel bored with the vase, so let us apply this into the human body (Figure 4). This is the same thing. When you want to treat a certain person, the person to be treated would be the Tai-ji/ the fundamental yang. The person exists as a patient. Here, we use the division of cold and heat. These are the replaced words of yin and yang. The body could be roughly divided into these two concepts. When you focus on the lower cold, this part becomes the Tai-ji. And we can estimate that this is also divided into cold and heat. Here, you can notice that the widths of heat and cold are not even, right? For the case of the vase, I dare to draw yin and yang even, but that was the simple upper and lower story, so I could do that. However, it is rare for the human body being divided into cold and heat in the middle, usually it is deviated. Unlike the fundamental yang, it can be said that this cold and heat are in the relative relationship. 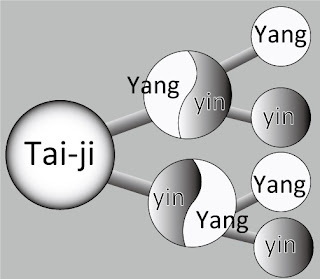 For yang of the Tai-ji that we are looking, the contents of it are yin and yang as the relative relationship. You can never say that the feet are always cold, can you? You can say that this person has the cold feet, or the feet are cold today, so this is kind of the relative relationship. Then, when you look the human body as yang of the Tai-ji, what is the fundamental yin, the power supporting yang of the Tai-ji? One is the gravity. Everything cannot exist without gravity. What is the other thing? The answer is life. There are two kinds of existences on the Earth; one is those without lives, and the other is those with lives. Human beings are one of those animated, so this thing which has a human shape can move uniquely by means of the life. So, for the human beings, they are related with two elements; the gravity and the life. For example, a person is standing. This is kind of a unique action due to the existence of the life. It can be said that capability of keeping to stand is the condition that the person has enough vital energy towards the gravity. When the vital force is weakened, one must feel hard to keep standing, want to sit down and lie down. Now, I'm also standing and giving a lecture, but I would like to finish it within two hours or something. Gradually, I feel tired and hard to keep standing. This is also because of the gravity, isn't it? We are always influenced by the gravity and act against it. So, you can say that diseases are in the state that one's power against the gravitational pull is getting weakened. Those who can walk to the clinic to receive treatment have certain power yet. Those who start to use a stick, those on wheelchairs, those who are carried, the condition becomes more serious in such an order. In the end, one cannot stand against the gravity and dies. It can be understood like this. In Shakuju therapy, we can look at any phenomena like this with cold and heat. 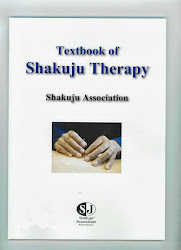 This is the characteristic of Shakuju therapy.